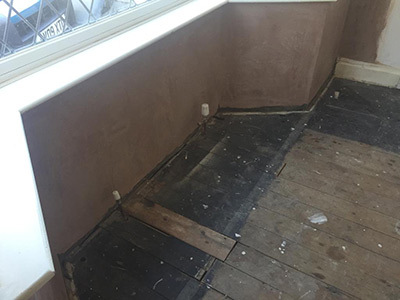 Rising damp can arise for various reasons; the failure of an existing damp proof course (dpc), bridging due to external high ground level or the complete absence of a damp proof course. Brick, stone and mortar are porous allowing damp from the ground to rise by capillary action, carrying with it ground salts including chlorides and nitrates. These salts from the ground can absorb moisture from the atmosphere leading to damp walls which will also break down internal plaster. We will provide a 20 year guarantee for the damp proof course injection in-conjunction with our 10 year guarantee for the specialist plastering. An additional GPI (guarantee protection insurance) guarantee can be purchased which will run alongside our own guarantee, please request a leaflet for further information. 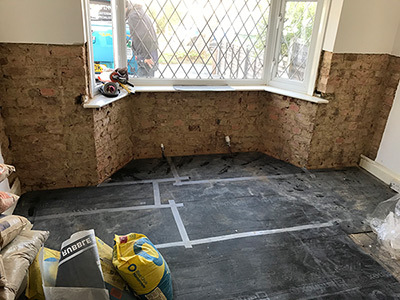 Replastering subsequent to our injected chemical damp proof course is an integral part of our damp proof course. The importance of our replastering specification cannot be stressed enough. Water rising from the ground contains mineral salt (for example: sulphates, nitrates, chlorides, etc), these mineral salts are hygroscopic and can attract moisture from the atmosphere. Our injected damp proof course along with our specialist replastering work together to control the effects of rising dampness to the property. Our specialist plastering team know the importance of using the correct plaster applications whether this be for rising damp, penetrating damp or basement specialist waterproofing; which is why we guarantee our plastering. All our plasterers have worked within the damp proofing preservation industry for over 20 - 30+ years. MOST IMPORTANTLY - We provide a 10 year guarantee with our specialist plastering works. We can carry out all plastering works including exterior render coatings, interior skim coat finish, floor screeds, specialist cementitious waterproofing plastering.